Ok, everyone, it’s Monday…let’s get rollin…. 27Just then his disciples came. They were astonished that he was speaking with a woman, but no one said, “What do you want?” or, “Why are you speaking with her?” 28Then the woman left her water jar and went back to the city. She said to the people, 29“Come and see a man who told me everything I have ever done! He cannot be the Messiah, can he?” 30They left the city and were on their way to him. 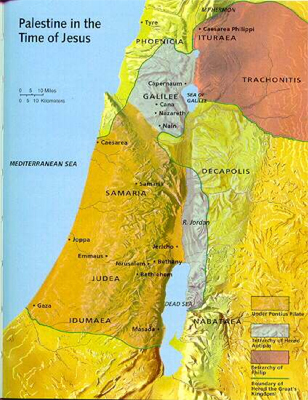 When I look at the map of the Holy lands in the time of Jesus I realize something that I hadn’t realized before. Samaria is smack in the middle of where Jesus needs to go and where he needs to be and yet we are told that it was pretty uncommon for Jewish folks to be in Samaria. Instead, they usually walked all of the way around Samaria to get to where they were going. For example, for Jesus to travel from Galilee to Judea, it was a normal thing to walk all of the way around instead of through. For Mary, when she finds out she is pregnant, to get to her cousin she probably would have walked all of the way around from Nazareth to somewhere near Jerusalem (remember her uncle was a priest in the main temple). This adds quite a bit of time to do! Why would they do this? Well, Samaritans were not the people to hang out with. They were Jewish. They weren’t who you wanted to associate with if you were a good rabbi type person like Jesus. And yet, today we find Jesus smack dab in the middle of the gentile country. He is hanging out in Samaria. He is chatting with women (gasp) at a well (double gasp) and spending time in Samaria with her (triple crazy gasp). And THEN when they ask him to stay….he DOES? (close to faint on the floor). Wrong people, wrong timing…and it makes a difference in the world. All of a sudden God is for everyone. All of a sudden it doesn’t matter anymore…. This has moved me this morning. I was struck yesterday in our prayers of the people that we prayed for some of our homeless population that hang out in the church by name. We prayed that they might find comfort in the warmth of hospitality. Wrong people, wrong timing and yet we prayed for these human beings by name so that we might hold them in our hearts. I was moved by the willingness of the community to continue to mingle with the “wrong people.” And it challenges me to figure out where I need to be next. Where am I am frightened to be just because of my own personal fears when really there are just people to get to know? Where have I decided that I don’t have the time to mingle when really the path is shorter to where I am going? Where do I walk all of the way around a situation because they aren’t my people yet? Prayer: Gracious God, you have called us to be challenged by breaking down walls, by mingling with the “wrong people,” and by opening up ways to make a difference in the world. Guide us through our fearful situations to relate to people and not labels. Journey with us in our time of repentance and turning back to you. Amen.